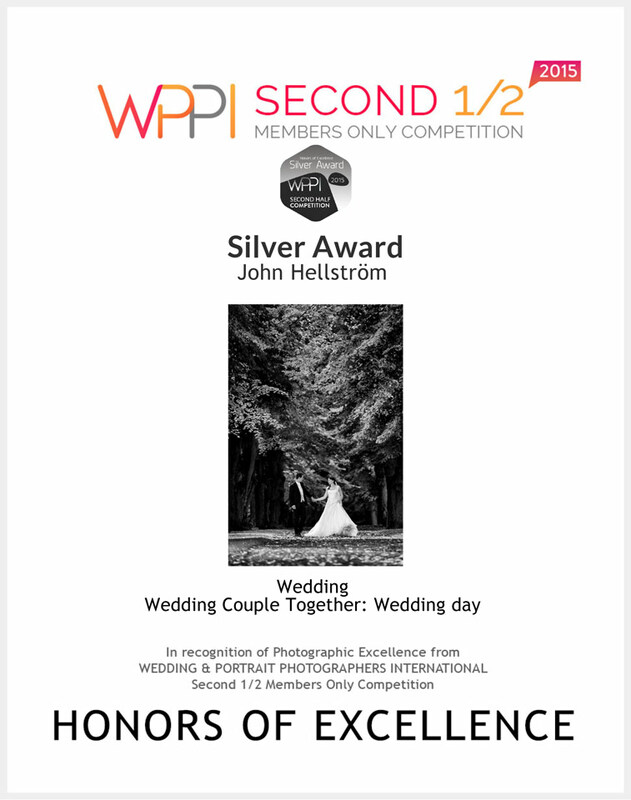 Svenska bröllopsfotografen John Hellström från Stockholm vinner hela tre utmärkelser "Honors of Excellence" i den internationella tävlingen för professionella porträtt och bröllopsfotografer, WPPI (Wedding and Portrait Photographers International) 2nd 2015 i New York, för sina bröllopsfotografier. Under hösten fick John Hellström även vitsorden "Highly Commended" för tre fotografier i tävlingen SWPP (the Society of Wedding and Portrait Photographers) i London. I januari 2016 så kommer den årliga "print competition" i London för SWPP och i mars i Las vegas för WPPI. Med erfarenheterna från 2015 i bagaget så kommer tävlingsbidragen ytterligare förfinas för att Sverige skall konkurrera internationellt inom bröllopsfotografering. WPPI är världens största organisation för yrkesfotografer inom bröllopsfotografering. 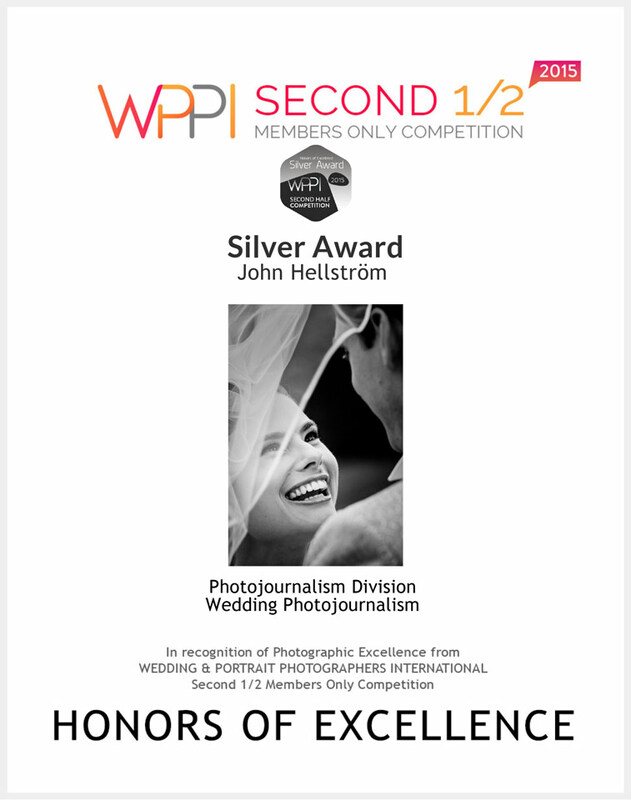 WPPI beskriver sig som "Wedding & Portrait Photographers International (WPPI) was founded in 1978 to serve the needs of wedding photographers, then known as the “weekend warriors??? – an often neglected segment of the industry. Since our first convention and trade show in 1980, we have grown into one of the largest events in the trade. WPPI 2014 drew over 12,000 attendees and 350 exhibitors and embrace photographers from all genres, including portraiture, fine art, photojournalism, commercial, video, and advertising. The WPPI values and ecosystem are built on the premise of developing one’s mind, body, and soul through the lens of photography and filmmaking. Our conferences, events, and contests are meant to promote growth and a community in which members learn from each other." Den största Europeiska organisationen för bröllopsfotografär är SWPP, som skriver följande på deras hemsida: "Established in 1988 under the Chairmanship of Derek Avery, the Society of Wedding and Portrait Photographers was founded to service the needs of professional wedding and portrait photographers, whether in full or part-time occupations. Founded at much the same time, the British Professional Photographers Associates under the leadership of Nigel Greenstreet, were working with similar goals but encompassed a broader range of photographers. Early in January 2000, the now Chief Executive of SWPP Philip Jones, was delighted to announce the merger between these two prominent organisations, under the umbrella of the SWPP. In a joint statement they believed that the new society would form one of the strongest photographic organisations in the UK, and their commitment to improving already high standards would be of benefit to all. The Society has seen its membership grow rapidly over the last year, with not only UK members but international photographers have also been keen to associate themselves with SWPP. A testament to the success of the Society as a whole." John Hellström är porträtt och bröllopsfotograf från Stockholm, Sverige.